This downtown reservation includes a small brook, a variety of trees, remnants of an old cranberry bog, and a variety of wildlife. A marked circular trail provides access to most of the land. 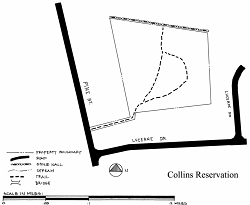 This property was given to AVIS in 1983 by Helen Collins Dooley in memory of her parents, Joseph Morris Collins and Margaret Scannell Collins, and her grandparents, Morris Collins and Mary Schofield Collins. At one time, the grandparents owned 25 acres of farmland along Pine Street. Entrance on Pine Street just south of #66. Pine Street is south off Elm Street. Do not use trail on Pine Street between #20 and #40. It is private land and is posted with a “No Trespassing” sign.